Here's another recipe I found in the coupon section of my Sunday paper. This one I managed to cut out! I mixed it up today, ready to pop in the oven and enjoy this weekend. MIX in salad dressing, Frank's RedHot Sauce and cheese. Stir in chicken. BAKE 20 min. or until mixture is heated through; stir. Garnish as desired. Serve with crackers or vegetables. I mixed everything in a mixing bowl and then put it into the baking dish. Also, I used a pint of chicken that my mom canned and gave me. For additional tips and variations or to print it, view the original Buffalo Chicken Dip recipe. I found this recipe once a long time ago. I made the cake. It was wonderful. Then I lost the recipe I knew I had a recipe for this hot, gooey, chocolaty dessert, but I could not find it. After lots of looking, I found it! Now, I plan to keep this recipe somewhere safe and accessible. This cake is quick, easy, and absolutely yummy. 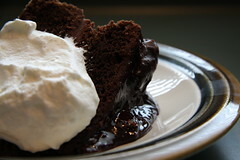 And since I didn't make anything for dessert this weekend, I think I'll make one of these! Heat oven to 350°. Mix flour, granulated sugar, 2 T. cocoa, baking powder, and salt in ungreased square pan, 9x9x2 inches. Mix in milk, oil and vanilla with fork until smooth. Stir in nuts. Spread evenly in pan. Sprinkle with brown sugar and 1/4 cup cocoa. Pour very hot water over batter. Bake 40 minutes. Spoon warm cake into dessert dishes and top with ice cream. Spoon sauce from pan onto each serving. Follow above directions, making sure to mix everything in a microwave-safe baking dish. Microwave uncovered on medium (50%) 9 minutes; rotate dish 1/4 turn. Microwave uncovered on high 5 to 7 minutes longer or until top is almost dry. Pillsbury is offering a Free 2010 Calendar to new email subscribers to their Pillsbury or Cooking 4 Two newsletters. I've been subscribed to the Pillsbury newsletter for a while but hadn't tried the Cooking 4 Two newsletter, so I was eligible for my free calendar. Just put your email address into the box at the top and click the 'Check Member Status' button to see if you're eligible. It's hard to believe, but I think the Cooking 4 Two newsletter is going to come in really handy. It promises delicious recipes just for two, tips for scaling down your favorite recipes, and much more! I pretty much cook for 3 of us nowadays, but since one of us is a teenage boy, it's like cooking for more! But, once he goes away to college or moves out, which won't really be that long now, I am going to need to rethink my cooking practices - because there will only be the two of us. While I was on the site signing up for my calendar, I logged in and grabbed a few recipes and saved them to my 'Recipe Box' because signing up for one of the newsletters also gives you full access to the Pillsbury.com website where you can find and save all kinds of yummy-looking recipes. I am definitely going to have to try these Cranberry Orange-Glazed Cinnamon Rolls. Don't they look yummy? This is Jeffrey's favorite pie. I got the recipe from his mom. He says I don't make it often enough, but I figure it's more special if he doesn't get it all the time, right? Melt German chocolate and butter in saucepan. Remove from heat and stir in evaporated milk. In bowl, mix with electric mixer: sugar, cornstarch, salt, eggs, and vanilla. Gradually blend in chocolate mixture. Pour into unbaked pie shell and top with mixture of coconut and pecans. Bake at 375° for 45 minutes, then cover with foil to stop browning and bake another 15 minutes. Remove from oven and cool at least 4 hours before cutting or refrigerating. and I'm not giving away Mom's secret recipe, because I found (almost) the same recipe online at Cooks.com. You'll want to cut this pie into fairly small pieces because it is so rich. I really want to try this Red Curry Chicken with Vegetables (Doesn't it look amazing?) so I'm hoping I win the giveaway at The Art of Random Willy-Nillyness. 5 winners will get Thai Kitchen Cooking kits that will include: 2 jars of red curry paste, 2 jars of green curry paste, 1 jar of roasted red chili paste, 1 bottle of fish sauce, a cookbook and a coupon for a free Thai Kitchen product of their choice. I've seen these products in the grocery store, but haven't yet tried them, so winning would give me a chance to try them and see if we like them. Entries must be received by Tuesday, December 8 at 11:59 pm EST. Get a free Martha Stewart Thanksgiving cookbook from Sirius. It features over 30 recipes from Martha Stewart and other famous chefs such as Emeril Lagasse, Nigella Lawson, and Mario Batali. The recipes cover all courses of the Thanksgiving meal, from savory turkey to fresh salads and creamy mashed potatoes to sweet desserts. I've looked through the table of contents and found a few recipes that sound really good. The cookbook is in pdf format, so you can download and save it, or print it for yourself. This recipe was on the back of my Pillsbury Whole Wheat flour. It sounded so good I had to try it, and the muffins taste just as good as I thought they would. In large bowl, combine beaten eggs, sugar, oil and vanilla; add milk; Stir in apples, carrots, raisins, and coconut. Combine dry ingredients and add, stirring just until moistened; add nuts. Fill paper-lined or greased muffin cups 3/4 full. Bake at 350° for 20 to 25 minutes or until toothpick inserted in center comes out clean. Remove from pan and cool. I may have to try these without the raisins if I want anyone else in my family to eat these. For some reason, they don't like raisins. Of course, if I leave the raisins in, that means more for me! These are great for breakfast, with coffee or just to snack on. I love this because I can mix it up the night before and the next morning all I have to do is pop it in the oven for fresh, hot coffeecake. Mix flour, baking powder, baking soda, cinnamon and salt and set aside. Cream margarine and sugars until light and fluffy. Add eggs, one at a time, beating well. Stir in buttermilk and then add dry ingredients. Spread batter into greased and floured 9"x13" pan. Mix all ingredients for topping and sprinkle over batter. Refrigerate overnight or for at least 8 hours. Sometimes I add coconut to the topping. When my kids were little, I poured the batter into 2 round cake pans instead of the 9"x13" pan. I baked baked both coffeecakes the next morning, one to eat and one to freeze. The coffeecake fit nicely into a gallon-size Ziploc bag. I saw this recently in the food section of my Sunday paper, and I thought it was really neat. It's called the Banana Saver, and it's made to keep your banana from bruising when you pack it in your lunch. How cool is that? And why didn't someone think of this sooner? They're designed to fit most bananas and even have a hole for the stem. 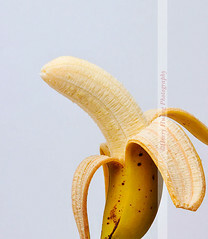 Imagine - completely portable bananas without all the brown spots. I just might have to get some of these to try. My cousin just posted pictures of some old family recipe cards, and this cake was one of them. Like my mom said, it's a super familiar recipe...very much a part of her childhood - and mine. I've heard of strawberries and shortcake, but I don't think I've ever had that. In our house it was always strawberries and mountain cake. We always had a large strawberry patch so we had plenty of strawberries, both to eat and to freeze for later use. I remember plenty of times we had strawberries and mountain cake for dinner! I always made this in a 13x9 pan, so the first time I made this after I got married, I didn't realize this recipe is only for a square cake pan. Of course, since we don't have our own strawberry patch, a square cake is plenty. With electric mixer, cream butter and sugar; add eggs and vanilla and beat well. Mix in milk. Combine dry ingredients, add to previous ingredients and mix well. Pour into greased square cake pan and bake 35-40 minutes at 350° or until toothpick inserted in center comes out clean. 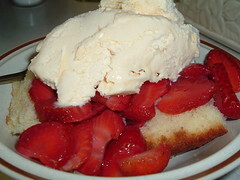 Serve with strawberries and whipped cream or vanilla ice cream. Enjoy! Now I'm wishing it was strawberry season. I made this one other time, and I was going to make it for dinner tonight. Then I remembered that Cory had play practice from 5-7, and Jeffrey wouldn't be home until later, and I decided to go with something simple like opening a can of Campbell's Chunky soup to go with the sourdough bread I made today. Now I'm think either we'll have this for dinner tomorrow night when we can all sit down together, or I will try the Indian inspired version with the rice and take it for the potluck on Sabbath. Prepare the linguine according to the package directions in a 3-quart saucepan. Add the broccoli during the last 4 minutes of the cooking time. Drain the linguine and broccoli well in a colander. 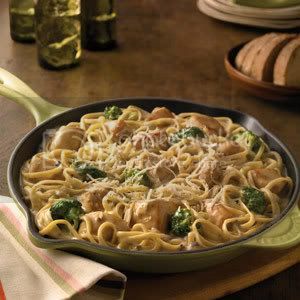 Stir the soup, milk, cheese, black pepper and linguine mixture into the skillet. Heat, stirring occasionally, until the mixture is hot and bubbling. Serve with additional Parmesan cheese. Indian-Inspired Tip: Omit the Parmesan cheese. Substitute 1 cup uncooked basmati rice for the linguine. Prepare as directed above. Stir 1 teaspoon curry powder and 1/2 teaspoon ground cumin into the skillet in Step 3. Sprinkle with toasted slivered almonds, if desired. Asian-Inspired Tip: Omit the Parmesan cheese. Substitute 1 package (6 ounces) rice noodles for the linguine. Prepare as directed above. Stir 1 tablespoon soy sauce, 2 cloves garlic, minced and 2 teaspoons minced fresh ginger root in to the skillet with the chicken in Step 2. When heating leftovers in the microwave, add a little milk to get the creaminess back. Find this recipe as well as many more at the Campbell's kitchen website. I started looking for a recipe for Pepper Steak last week - because I had steak, and I had peppers, and it sounded good. Would you believe how many recipes there are for Pepper Steak? And I only looked at Cooks.com because I grabbed a couple recipes from there a while back. I looked at the recipes I wanted to try before, but neither one of them sounded right - and I neglected to make any notes about which one I tried and how we liked it. So I just started looking again, found one and adapted it. Mix soy sauce, garlic, salt, pepper,oregano and salad oil together and pour on steak strips. Let set for 1 hour. Pour into frying pan. Allow meat to brown thoroughly on all sides. Add peppers, onions and celery. Cover and cook 5 to 10 minutes over medium low heat or until vegetables are tender. Stir in cornstarch dissolved in water. Stir until thickened. Add tomatoes; cover and cook 5 to 10 minutes or until meat is tender. Add cooked, drained noodles and mix well. Cover and cook for a couple more minutes to heat through and blend flavors. The original recipe said round steak. I'm not sure what kind of steak I used - just whatever was in the freezer. It turned out really good. I cut this recipe off my brown sugar package. It's been sitting on top of my canisters for a couple weeks just waiting for me. Today I finally made these bars - haven't tried them yet, but they smell wonderful! In large bowl using a pastry cutter, fork, or your fingers, combine first four ingredients until crumbly. Pat into baking dish. Bake 10 minutes at 375°F. Sprinkle chocolate pieces over hot crust; return to oven about 1 minute to soften. Spread chocolate evenly over crust. In medium bowl, beat eggs until thick and lemon-colored. Beat in sugar and vanilla. Combine flour, baking powder and salt and beat into sugar mixture. Stir in coconut. Spread evenly over chocolate layer. Bake 15 to 20 minutes. Cool in pan and cut into bars. This recipe was copied from the C&H website, slightly edited. There are lots more great-sounding recipes to choose from, too. It looks like I don't have to save the recipes from my sugar bags any more, just visit the web page and look them up. ETA: These were a big hit at the church potluck. I made the first dip yesterday. The other two recipes I found on my yogurt container and on the Triscuit box. I haven't tried them yet, but they sound really good. I'm saving them here so I can throw the Triscuit box and the foil from the top of the yogurt away. In a small mixing bowl beat cream cheese, mayonnaise or salad dressing, paprika, black pepper, garlic powder or garlic, and ground red pepper until well combined. Stir in the tuna, sweet pepper, and green onion. Cover; chill for 3 to 24 hours. Serve with crackers. Makes 1-1/2 cups. The recipe says to use an electric mixer to beat the cream cheese, salad dressing and spices, but I just used a mixing spoon. It seemed to work fine. Also, I didn't have any green onions so I just used some chopped yellow onion. Really good with Triscuits and Wheat Thins. Mix all ingredients; cover. Refrigerate several hours or until chilled. Makes 1-1/2 cups. In bowl, combine all ingredients and mix well. Cover and keep refrigerated until ready to use. I think all of these would be really good with either crackers or cut up veggies. Stir fry is one of our favorite meals. I usually just use frozen stir fry vegetables, so it's really easy to make, too. Marinate for at least 30 minutes. Heat a little oil in large skillet; add marinated chicken and cook, stirring occasionally, about 5 minutes or until cooked. 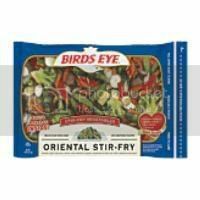 Add stir fry vegetables - 2 16-oz. packages, 1/2 of a 64-oz. package like the one from Birds Eye, or at least 4 cups of cut up fresh vegetables. Cook until frozen vegetables are hot or until fresh vegetables are crisp tender. Add sauce* and heat through. 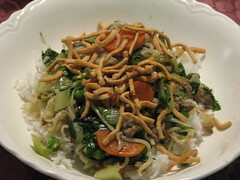 Serve with rice and chow mein noodles, and pass the soy sauce. You can do just about anything you want with this. I picked the first zucchini from my garden Friday, and I had a green pepper that needed used. So, I cut those up and added them when the chicken was just cooked. I cooked the chicken, zucchini, and peppers, (and a little onion) for a couple minutes, and then I added the frozen vegetables (not quite 1/2 a package of the Birds Eye because I had used extra the last time) and cooked until everything was hot, then added the sauce that came with the frozen vegetables. It turned out so well that I'm thinking I need to start using more fresh vegetables in my stir fry! I wasn't planning on making dessert this weekend, but one of my friends had to post a recipe for a rhubarb crisp. It sounded so good, I thought I'd try her recipe, but then I didn't. Oh, I still made dessert, but I used a recipe I got from my mom instead. I'm sure Susan's recipe is really yummy, but so is this one - and because she had to mention strawberries with the rhubarb, even though she didn't include strawberries in her recipe, I decided to add some of those, too. While I love rhubarb for itself, strawberries and rhubarb are a great combination, too! Combine first three ingredients and a dash of cinnamon. Place in greased 13x9" pan. Combine brown sugar, oats and flour. Cut in butter and shortening until crumbly. Sprinkle over rhubarb mixture. Bake at 375° for 40 minutes. Serve warm with ice cream, whipped cream, or milk. So good warm from the oven with vanilla ice cream! I picked the first zucchini from my garden this morning, so I'll be needing this list of zucchini recipes soon. Some of these we've tried, and some I just want to try. Those zucchini plants better get busy - I have big plans! I know some people eat meat loaf on a regular basis, but we rarely have it. This week I had some potatoes that needed used and decided to make mashed potatoes. Obviously, I needed something to go with those mashed potatoes, so I decided to try making meat loaf again. I used the recie from my Better Homes & Gardens cookbook and changed it a little. Then, instead of making an actual loaf, I made mini loaves using my muffin tin. In a mixing bowl combine egg, cracker crumbs, milk, onion, green pepper, parsley, Italian seasoning, salt and pepper. Add ground beef and mix well. Divide mixture evenly into 12 muffin cups. Bake 20-25 minutes at 400° or until done. Remove mini loaves from muffin tin and place on baking sheet. Reserve one loaf for making gravy, if desired, and top the remaining loaves with barbecue sauce. Return to oven and bake for an additional 5 minutes, or more. Removing the loaves from the muffin tins before adding the barbecue sauce gets them out of the grease, and they brown up nicely on the baking sheet. I think the grease is one of the reasons I never really like meatloaf, but this really seems to help. I used the reserved loaf and the grease from the muffin tin to make gravy, which went really well with my mashed potatoes! It's kind of like macaroni and cheese, only with more stuff in it. I use cooked chicken and turkey interchangeably - whatever I have. Last week I cooked a turkey, so I used turkey. Saute chopped onions in butter and mix with cooked macaroni. Spoon into greased 9"x13" baking dish. Sprinkle with grated cheese. Break up uncooked broccoli and place over cheese. Cover with cubed chicken or turkey. Combine soup, milk, salt and curry powder. Pour over other ingredients in baking dish. Cover with grated cheese. Cover and bake at 375 for 30 minutes. Uncover and bake 5-10 minutes longer. The original recipe came from my favorite cookbook, The Best of Mennonite Fellowship Meals, but of course I've changed it up to suit my tastes. I pulled my sourdough starter out of the fridge last night, planning to bake my Whole Wheat Sourdough Bread today. Then I forgot about it and didn't measure out my starter and mix it up with the water, flour, and 7-grain. I remembered this morning - but that's OK, as long as I get it started first thing in the morning, I can make it in one day. So, I quickly got it mixed up, without looking at the recipe. I remembered I needed 1 cup of starter, 3 cups of warm water, 3 cups whole wheat flour, and some of the 7-grain cereal - so I added the water and the flour and then went to look at the recipe to find out how much cereal. 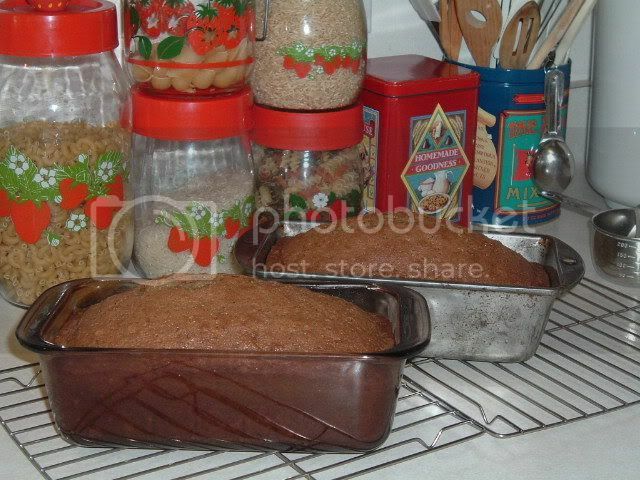 That's when I discovered that I only needed 1 cup of water and 1 cup of flour for this recipe. Oops, too late! I was thinking of my recipe for Sourdough Pancakes - that one takes 3 cups of water and 3 cups of flour. So today I just had to make enough dough for 3 loaves of bread, instead of 1. In large bowl, combine 1/2 cup unbleached flour, whole wheat flour, sugar, salt and yeast; blend well. In small saucepan, heat milk, water and shortening until very warm (120 to 130°F). Add warm liquid to flour mixture. Stir by hand until dry ingredients are moistened. Stir in an additional 1/4 to 3/4 cup flour to form a stiff dough. On floured surface, knead in 1/4 to 3/4 cup flour until dough is smooth and elastic, about 5 minutes. Place dough in greased bowl; cover. Let rise in warm place (80 to 85°F) until light and doubled in size, about 1-1/4 hours. Punch down dough several times to remove all air bubbles. On lightly floured surface, roll dough to 16x12-inch rectangle. In small bowl, combine brown sugar and butter; blend well. Spread evenly over dough; sprinkle with nuts. Starting with 16-inch side, roll up tightly, pressing edge to seal. Cut into 16 slices; place cut side down in greased 9-inch square pan. Cover; let rise in warm place until light and doubled in size, 45 to 60 minutes. Heat oven to 350°F. Uncover dough. Bake 25 to 30 minutes or until golden brown. Cool 2 minutes; turn onto serving plate. Makes 16 rolls. Of course I just took the dough I had, rolled it out and spread it with the brown sugar, butter, and nuts. Then, instead of letting the rolls rise completely and baking them right away, I covered them with plastic wrap and put them in the refrigerator. Tomorrow morning I can take them out, let them come to room temperature and rise, and then bake them. 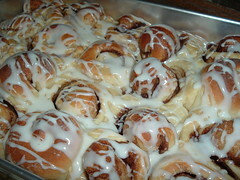 That way we get to have fresh, warm, ooey, gooey caramel rolls for breakfast. Hopefully they'll be as good as they sound and I'll remember to take a picture or two before we eat them all. I found this recipe ages ago in the coupon section of the newspaper, but I hadn't made it in years. I don't know why it's been so long. This is really good, and so easy. In large skillet (10 inch), prepare Rice-a-Roni mix as package directs, except simmer 10 minutes. Stir in chicken, basil, broccoli, and tomato. Cover, continue to simmer 5 to 10 minutes or until liquid is absorbed. Sprinkle with cheese before serving, if desired. I used cooked turkey instead of chicken, and peeled and chopped a frozen tomato. The original recipe calls for broccoli, but green beans are good, too. Also, I did not have any Mozzarella, so I used cheddar. Parmesan works, too. Combine apples, cranberries, sugar and cinnamon. 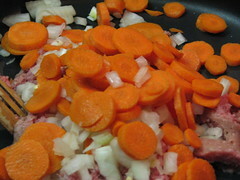 Mix thoroughly and place in a 2-quart casserole dish. Set aside. Combine oats, brown sugar, flour, pecans, and butter. Mix until crumbly and spread evenly over fruit. Bake at 350° for 1 hour or until fruit is fork tender. 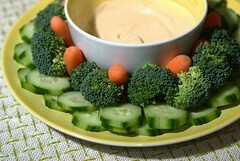 Beth and Tim made this dip last night. They mixed all the ingredients up and put them in the crockpot on low, and left it overnight. That was too much cooking for the cheese, so this is the adjusted recipe - cook everything overnight and then add the cheese the next day. In crockpot add all canned items. Brown sausage and ground chuck, drain and add to crockpot mixture. Add garlic powder, and cook on low for several hours or overnight. About half an hour to an hour before serving, stir in Velveeta, cover and cook until melted, stirring occasionally. Serve with corn chips or tortilla chips. Tim also stirred in some fresh jalepenos to spice it up, but this is quite spicy on its own. Note: Unless you're going to have a big crowd, you might want to cut this recipe in half because it makes a lot. My 5-quart crockpot was filled to the top. I jotted this recipe down on an old envelope several years ago. They were doing a segment on the news about how citrus in your marinade counteracts the carcinogens caused by grilling. I just thought it sounded good. Mix; Marinate chicken several hours or overnight; grill as usual. This makes amazing grilled chicken and should probably be called Best Marinade Ever. I found this recipe in the Kraft Food & Family magazine. I didn't follow it exactly, because I practically never follow a recipe exactly. Mainly, it called for a brownie mix (13x9 inch pan size), which I didn't have, so I made my own brownies. Combine cocoa and sugar; cream mixture with margarine. Add eggs; mix well. Add flour and mix. Add vanilla. Spoon batter into 20 paper-lined muffin cups; set aside. Beat cream cheese, sugar, egg, peanut butter and vanilla with mixer until blended. Spoon 1 rounded Tbsp. into center of batter in each cup, pressing down slightly into batter. Bake 30 minutes at 350° or until centers are set. Remove from oven and remove brownie cups to rack to cool. While they are still hot, place 4 or 5 chocolate chips on the top of each brownie cup. When chocolate chips begin to melt, use a knife to spread them over the top of each brownie cup. I added the chocolate chips to the top because the original recipe called for Cool Whip and cherries on top, and that just didn't seem right to me, but they just needed a little something on top. I also changed the name from Brownie 'Babies' to 'Cups' because calling them babies made it sound like they should be made in the mini muffin cups, and they are definitely full size. And they are definitely yummy - I don't think you can go wrong with chocolate and peanut butter. I found this recipe in a magazine several years ago. Of course I modified it to suit my tastes! It's really easy to make, and we all like it, so we have this quite often. Put turkey, onion, carrots and garlic into a large skillet. Cook over medium-high heat 5 to 6 minutes, stirring often, until turkey is lightly browned. 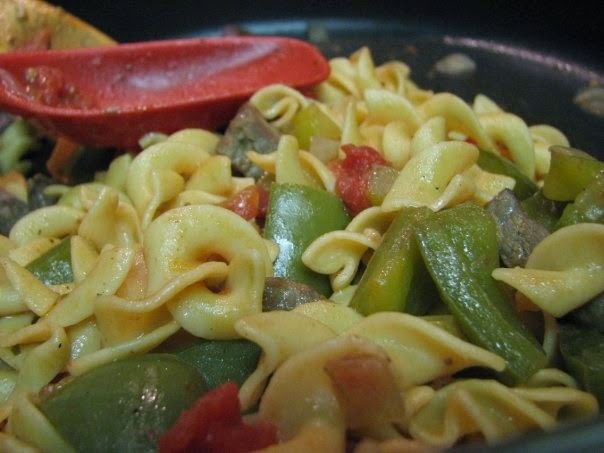 Break noodles into skillet. Stir in seasoning packets, water and peas. Bring to a boil, cover and cook 3 to 5 minutes until noodles and vegetables are almost crisp-tender. Stir in lettuce. Cook uncovered 3 to 4 minutes, stirring almost constantly, until lettuce is wilted, noodles are soft and carrots are crisp-tender. Pass the soy sauce and chow mein noodles! I make cinnamon rolls quite often, but they're usually for the weekend. This week, however, I made them on Tuesday. They weren't my usual cinnamon rolls, though. Beth had brought home some Amish Friendship Bread starter, which she made bread with and divided into additional starter just like she was supposed to. But she failed to give any of those extra bags of starter to anyone, except me. The day came to add flour, sugar and milk to the starter, and I refused to do it for all of those extra bags, so we put them in the freezer for later. When it came time to add to and separate my own starter, I didn't really feel like having additional bags of starter, and I didn't really want to pass them out. So, instead of adding milk, flour, and sugar to the starter I had, I just measured it out. The bread recipe calls for 1 cup starter, and I had about 2-1/2 cups, so I figured I could just divide that and make 2 batches. I made one recipe (2 loaves) of the traditional Amish Friendship Bread, and I made cinnamon rolls from the other half of the starter. I had a recipe that I had tried another time, but I didn't follow it exactly, so I'm posting my version. Let sit at room temperature overnight or 10-12 hours. You'll know it's ready when it's all bubbly and has risen up the bowl. Stir down. and add all at once to the larger bowl. Mix well, then add as much of 3 cups of flour you can mix in with a spoon. Turn dough out onto a well-floured counter and knead in enough additional flour that it is no longer sticky. Cover with a cloth and let rest for about 30 minutes. Divide dough into two halves; roll each half out in a rectangle about 12x8-inch. Brush dough with soft butter. Sprinkle cinnamon sugar mixture over dough. Beginning at the wide side, roll up, and seal seam. Cut each roll into 10 slices. Place in greased 13x9 inch pan. Cover and let rise in a warm place till nearly double (about 30 minutes to an hour). Bake at 350° for 35 minutes or until done. FOR ICING: In a small mixing bowl stir together powdered sugar and vanilla. Stir in enough milk to make a smooth icing of drizzling consistency. Drizzle over rolls. Serve warm or cool. The original recipe also called for 1/2 t. baking soda and 1 t. baking powder, but it really doesn't need it. The only leavening is from the fermentation of the original starter. These rolls are a little more filling than my usual cinnamon rolls. I can only eat a couple at a time, so they've lasted all week. Beth and I have been enjoying them for breakfast. I guess I can forgive her for bringing home, and keeping, all that starter in the first place. Stir together flour, soda and salt; set aside. In large bowl beat butter, peanut butter and sugars until creamy. Beat in eggs, milk and vanilla. 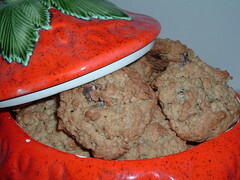 Stir in flour mixture, then oats, chocolate chips and raisins. Drop by rounded tablespoonfuls 3 inches apart on ungreased baking sheets. Bake in preheated 350º oven about 13 minutes or until lightly browned. Remove to rack to cool. All the goodness of peanut butter, oatmeal, and chocolate chip cookies in one! I don't usually add the raisins because no one in my family likes raisins - except me. Coconut is good in these, too. I can't remember where this recipe originally came from, but these are the cookies I make most often. Our traditional Passover meal is roasted lamb, these potatoes, and peas. Additionally we have unleavened bread, pickles and olives, and maybe some salad, but the main meal is relatively simple and oh so good. Toss the potatoes with the olive oil, and season with salt and pepper. Place the potatoes in a baking dish and scatter thyme on top. Heat oven to 375° F. Cover and bake until tender when pierced with a knife, about an hour. Several times during baking, give the pan a shake. When done, let the potatoes cool. Serve the small ones whole; slice the larger ones lengthwise. I usually use two 3-lb. bags of potatoes and multiply all ingredients accordingly - except I probably don't use quite as much thyme. These are so good. And so easy.